After 20 Years, Can Cornell Finally Bust Open Its Great Pumpkin Mystery? : The Two-Way In 1997, someone speared a pumpkin on the top of a 173-foot tower. It stuck around for months, an object of fascination and speculation. And no one knows who did it ... unless you know. Wait, do you? A pumpkin sits perched atop a bell tower on Cornell's campus, where a prankster placed it in Oct. 1997. 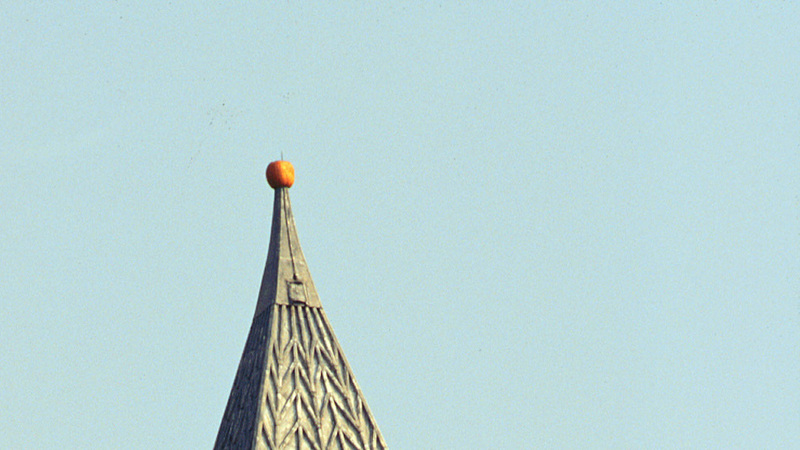 In 1997, someone speared a massive pumpkin on the spire atop of Cornell's McGraw Tower ... 173 feet in the air. He calls the pumpkin-ing of the tower "the greatest prank in Cornell history." And he's asking the pranksters — or those who love them — to step forward and claim their glory. 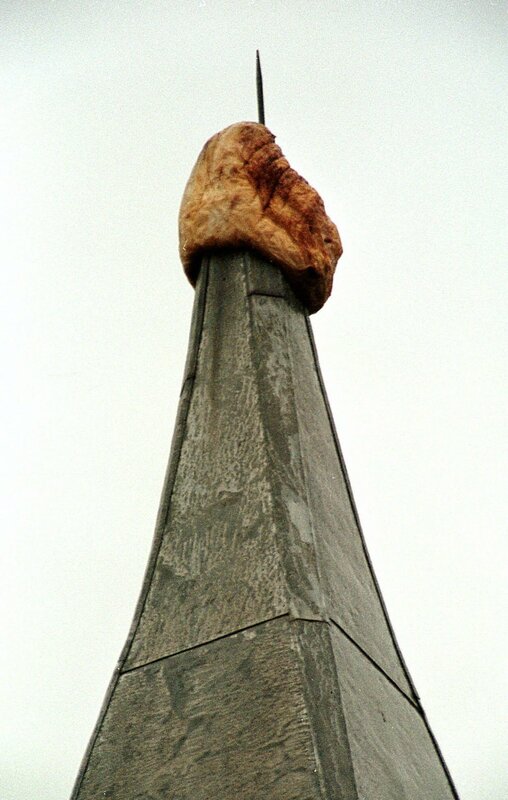 A highly weathered pumpkin sits atop the 173-foot tall McGraw Tower at Cornell University on Feb. 20, 1998, in Ithaca, N.Y. The pumpkin, estimated to weigh some 50 pounds originally was put up by unknown persons on Oct. 8, 1997, and surprised the campus by lasting through the winter. "From what I know, the reason that they didn't confess initially was that it was a huge thing and they were college kids and it was potentially illegal," Manjoo tells NPR. "I mean, I think it was illegal — and it was dangerous, and they worried they might get in trouble. "But all of that has passed now. Now they're just legends." Manjoo tells the pranksters he can see "no downside" in coming forward now. The pumpkin was famous in its day, on the Cornell campus and beyond. It got a dedicated webcam — at the time, a new and novel Internet attraction, drawing clicks from around the world. For a while, it was the object of a daily "Pumpkin Watch" feature on the student paper. Outlets from the Associated Press to MTV ran coverage of the gourd. Students wrote pumpkin-themed lyrics for the school song. The pumpkin couldn't stay there forever. On March 13, 1998, the campus was preparing to send provost Don M. Randel aloft in a crane bucket to retrieve the frozen pumpkin with great aplomb. But things didn't go as planned. "An errant gust of wind ... sent the then-unoccupied crane bucket into the side of the tower, causing the pumpkin to fall 20 feet to a construction scaffold," Jacob Rubashkin, associate editor of the Cornell Daily Sun, tells NPR. So instead of plucking it off the spire, Randel "picked up the pumpkin from the scaffold." "After two weeks of analysis via 'microscopic slides, videotapes and photographs,' a special panel of plant biology professors announced that it was, indeed, a pumpkin. "Its remains were freeze-dried and kept in a glass case in the visitor's center, then added to a display of brains in the psychology department, and finally found a permanent perch in the office of professor Barbara Finlay. Eventually, the infamous vegetable decayed completely." The pumpkin itself may be long gone, but Cornell hasn't forgotten the feat. And Manjoo thinks it might be time for a revelation. For the final scene in the Scooby-Doo episode. For the unmasking. Time for the Pumpkin Pranksters to step forward. In 1999, Manjoo got an anonymous tip explaining how the prank was done — it involved some daredevil clambering up the tower's steep spire, and some strategically placed duct tape. But that tipster never named names. "You know what's awesome about today, versus 1999? Exactly, viral true-crime podcasts! Remember "Serial"? I'm thinking same thing, but with the pumpkin and the tower; we can even find a way to weave Casper into the story somehow, if that will help with sponsorships. "Or wait, I've got a better idea. How about a viral hashtag that encourages the pranksters to confess? It's been 20 years. They pulled off the best prank Cornell has ever known. Decades later, we can finally let them take a bow for risking their lives to give us 20 years of lonely pondering. Pumpkin pranksters, tell us who you are! #PumpkinAmnesty!" Along with that cry for information, Manjoo also republished his 2000 story about how the feat was, allegedly, pulled off. You can read the full story here. Meanwhile, of course, life goes on at Cornell. Students study. Researchers research. And as it happens, there was a second story out of Cornell's newsroom today. It turns out — and I'm not making this up — a team of Cornell-affiliated scientists have just sequenced the genome of "two important pumpkin species." A previous version of this post said Manjoo's story was published in 1999; it was based on a 1999 tip, but published in 2000. A previous version also included details from an Atlas Obscura post that were inaccurate and have been removed.